I was asked to test the new Naish freerace model for Kater Funsports. It is a reasonable prized sail. From the shop I also got the required 2010 Naish 75% mast, just the combo they would like to sell. It was the end of the season when I tried the sail, quite cold and windy for the 7.0. I just wanted to know if the Grandprix compared to a RS:Slalom or V8 from Neilpryde. Compared to my totally tuned-up RS:Slalom MK3 6.2 the difference was 5km/h, it was not really fair compare since against all my expectations this Naish is designed to be sailed small. The sail has lots of bottom-end, I overdownhauled slightly with 2-3mm. Still the sail got massive power above the boom. I would definitly compare this sail with the Neilpryde V8 (or H2) class. TO go fast with this grandprix I would suggest to sail it small and not overpowered. The Grandprix could be updated to a higher performance level sail (by yourself?!?). I felt like a flextop (unifiber??) mast would help giving control in all winds (I also sailed a flextop mast for a long time in my gaastra vapors it worked very good). The bottom battens were a bit to shore to really tension them good. Last but not least adding a tackstrap would be usefull. The quality of the sail was outstanding, also the lighter materials are nice, eventhough the 75% mast is not able to give these light materials an added value. 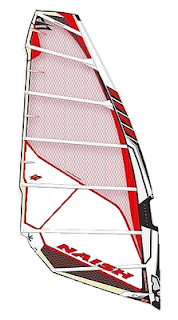 If you are a recreational windsurfer, speed between 45 and 65km/h this Grandprix sailrange would be a good value for money solution, especially on longer term (lets say you would like to sail more than 1 season). For real speedsurfing performance I don't believe it will be easy to make the Grandprix as competitive as a Neilpryde RS:Slalom MK3. It is hard to equal the MK3 in performance.